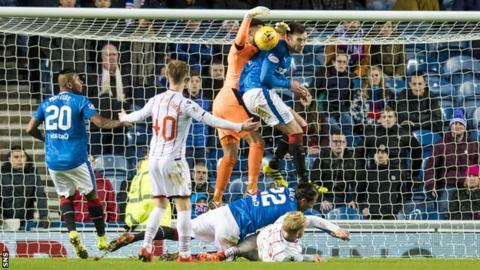 Owen Coyle felt Ross County were denied a clear penalty near the end of Saturday's 2-1 defeat by Rangers. County led at Ibrox through Craig Curran but Alfredo Morelos and Danny Wilson replied for the hosts. "We were terrific and we certainly shouldn't be leaving without any points in the game," said manager Coyle. "We had an absolute stonewall penalty in the last minute when big Andrew Davies has run in, [Bruno] Alves just throws him right to the ground." Staggies captain Davies and Rangers defender Alves had both returned to their respective starting line-ups. "You should be able to get a penalty wherever it is if it's a penalty," Coyle told BBC Radio Scotland. "That's very simple. "I've been in to see the officials. They're always charged with a difficult job but to his mind he's told me that he's not seen it. That kind of compounds it because it's the clear vision of where the ball's travelling. "Davies - terrific header of the ball and Alves knows that, he's a clever player and he's pushed him to the ground to avoid the skipper getting on it." Coyle was enthused with his side's performance and they remain four points above bottom side Partick Thistle and level with 10th-placed Dundee. "The goal we scored, a wonderful goal, passing and movement," Coyle said. "[Jason] Naismith was outstanding down the right side, Rangers couldn't deal with him. Great ball in, Curran finishes. "We did that a lot in the first half. Rangers had spells of pressure, of course they did, but there was nothing that we ever felt that cut us open. "The winning goal from the free-kick - we've got to defend that better. "We had some wonderful chances in the second half through good football so what I do know is if we continue to play in that manner, there's going to be plenty points and plenty wins available to us as we continue to move forward." Rangers interim manager Graeme Murty was in charge for a seventh match in a row after the club's unsuccessful approach for Aberdeen boss Derek McInnes this week. He has now guided the Ibrox side to three successive wins - a feat that eluded Pedro Caixinha prior to his sacking in October and last achieved by Rangers under Mark Warburton in December last year. "Relief tinged with a bit of frustration, the fans and players would agree with that, as we didn't hit the heights we did last week," Murty told RangersTV. "They made it extremely difficult for us and we didn't play with enough tempo at times, but credit to the players as they managed to find a way to win. I have to pat them on the back for that, although we know we can be better. "It's really hard when you're not flowing and people are getting frustrated in the crowd, it's difficult then to show your best but they managed to hit some peaks albeit not often enough or with enough consistency. "As a team we put that to bed and prepare because we have a big game on Wednesday. Credit to Ross County as well, they played nicely and moved the ball well." Meanwhile, Murty revealed Ross McCrorie, who was replaced in the second half by Jamie Barjonas, "took a sore one" and would be monitored.